Phil Jagielka's spectacular injury-time equaliser earned Everton an unlikely Premier League point in the 223rd Merseyside derby. It had appeared Steven Gerrard's superb second-half free-kick would give Liverpool victory until Jagielka's scorching, swerving shot into the top corner from 30 yards stunned the home fans. A draw will be a huge disappointment for Liverpool, who had come into the game desperate to kick-start their season after a sluggish beginning following their summer spending spree. But the Reds' recent problems in finding the net again proved costly, with their failure to take their chances leaving them with one point from a game where they will feel they deserved all three, and just one win from their last five league matches. Everton have also been in lacklustre form but, although they have still not won at Anfield for 15 years, a draw and their resolute defensive display represents a decent return on the day. The game began in typical derby fashion with a flurry of early incidents, starting with Gareth Barry's booking for taking out Liverpool's Adam Lallana inside the first 45 seconds. There could have been an early penalty at either end, firstly when Alberto Moreno tugged back Everton striker Romelu Lukaku and then when Raheem Sterling's shot hit Barry's hand. But, in a week where there have already been 31 spot-kicks at Anfield - in the Reds' Capital One Cup win over Middlesbrough - referee Martin Atkinson chose not to add to that tally. As well as fouls and misplaced passes, there were plenty of chances for the crowd to get excited about too. Most of them went to Liverpool but, in the continued absence of injured striker Daniel Sturridge, who cut a frustrated figure in the stands, the Reds again struggled to create clear-cut openings. Toffees keeper Tim Howard still had to be at his best to turn away Lallana's header from Gerrard's corner, and the American also punched away stinging efforts from Jordan Henderson and Sterling. But Everton's leaky back-line, which had conceded 13 goals in the first five league games of the season, largely succeeded in keeping Mario Balotelli and the rest of the Liverpool attack at arms' length. The pattern continued into the second half, with Liverpool having the better openings but unable to make the breakthrough. It would fall to Gerrard, criticised for his performance in last week's defeat by West Ham, to change that in the 65th minute after Leighton Baines fouled Balotelli on the edge of the box. Gerrard curled his free-kick over the wall and beyond Howard, who got a hand to the ball but could not keep it out. Balotelli should have made it 2-0 soon after but hit the bar from Sterling's cross and, after sending another shot bouncing wide, his wait for a first league goal for Liverpool goes on. It did not appear those misses would matter, such was the lack of threat the Toffees were posing. But Jagielka had the last word in dramatic fashion, thundering home an unstoppable shot after a headed clearance from a corner fell to him on the half-volley well outside the area, and his 10th goal in Everton colours will be by far the most memorable he has scored. Everton's Kevin Mirallas lasted just 29 minutes before going off with what looked like a hamstring injury. Attempt missed. Gareth Barry (Everton) right footed shot from the right side of the six yard box is close, but misses to the right. Assisted by Leighton Baines following a set piece situation. Romelu Lukaku (Everton) wins a free kick on the right wing. Goal! Liverpool 1, Everton 1. Phil Jagielka (Everton) right footed shot from outside the box to the top right corner. Substitution, Liverpool. Rickie Lambert replaces Mario Balotelli. Attempt missed. Aiden McGeady (Everton) right footed shot from outside the box misses to the right. Assisted by Leighton Baines. Attempt missed. Samuel Eto'o (Everton) right footed shot from outside the box is too high. Assisted by Aiden McGeady. Attempt missed. Mario Balotelli (Liverpool) right footed shot from outside the box misses to the right. Assisted by Simon Mignolet. Substitution, Everton. Samuel Eto'o replaces Muhamed Besic. Attempt missed. 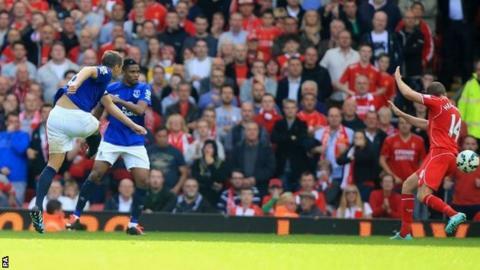 James McCarthy (Everton) right footed shot from outside the box misses to the left. Assisted by Phil Jagielka. Substitution, Everton. Tyias Browning replaces Tony Hibbert. Attempt saved. Jordan Henderson (Liverpool) left footed shot from outside the box is saved in the centre of the goal. Attempt blocked. Philippe Coutinho (Liverpool) right footed shot from the left side of the box is blocked. Assisted by Raheem Sterling. Foul by Aiden McGeady (Everton). Steven Gerrard (Liverpool) is shown the yellow card for a bad foul. Aiden McGeady (Everton) wins a free kick in the defensive half. Mario Balotelli (Liverpool) hits the bar with a left footed shot from very close range. Assisted by Raheem Sterling with a cross. Attempt saved. Romelu Lukaku (Everton) header from the centre of the box is saved in the centre of the goal. Assisted by Muhamed Besic with a through ball. Goal! Liverpool 1, Everton 0. Steven Gerrard (Liverpool) from a free kick with a right footed shot to the top right corner. Tony Hibbert (Everton) wins a free kick in the defensive half. Attempt blocked. Raheem Sterling (Liverpool) right footed shot from outside the box is blocked. Attempt saved. Steven Naismith (Everton) right footed shot from outside the box is saved in the top centre of the goal. Assisted by Romelu Lukaku. Substitution, Liverpool. Philippe Coutinho replaces Lazar Markovic.